Another weekend swooshed by in no time. There’s a pop-up arts festival called Hidden Doors going on at the moment in the unused vaults on Market street here in the Burgh. 24 vaults have been turned into different art installations, stages and cinemas. It’s free to enter until 6 pm and the festival is on until April 5th – so you still got time to pay a visit! I wonder why these vaults aren’t used more often – they’re right in the city centre and they could easily be made up for different happenings. 40 bands will play during the festival. This was one of the bigger vaults, whereas some were so low that you couldn’t stand up straight. As you can see, the place was heaving. Outside the festival we bumped into this guy. We told him to be careful, but he just ignored us. 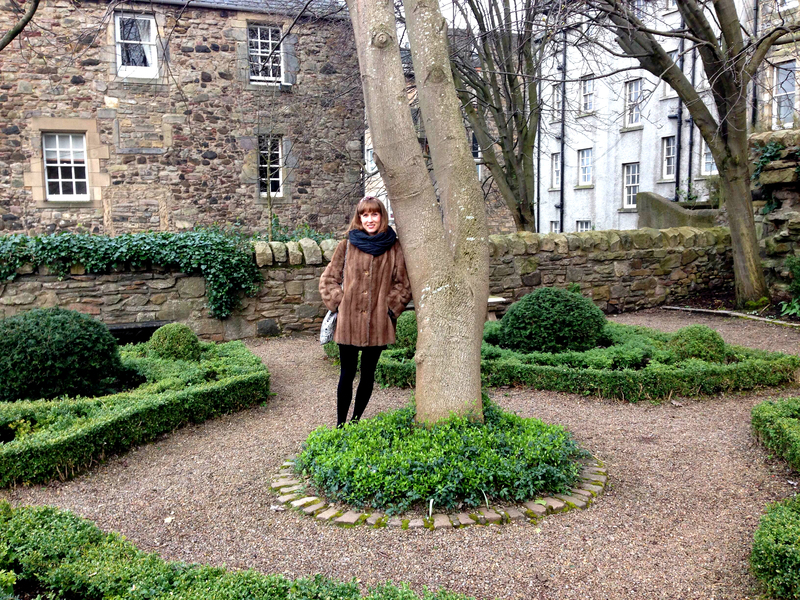 There are many small, hidden gardens just off the Royal Mile (the main street going through the old town), and we happened to see this one (Dunbar’s Close Garden ) and decided to check it out. We didn’t get far before we spotted the People’s Story Museum that showcases the lives of Edinburgh’s ordinary people at work and play from the late 18th century to today. It didn’t take long before Matthew made a new friend. We also popped into the Fudge House of Edinburgh to get Matthew’s mum some treats for Mother’s Day. The key lime pie fudge was amazing. Before heading home we had lunch at Hemma, where I hadn’t noticed these cool windows before. At home I totally destroyed Matthew at Scrabble (let me point out that English is my 3rd language), before heading out to Leith for the lovely Hanna’s birthday drinks.